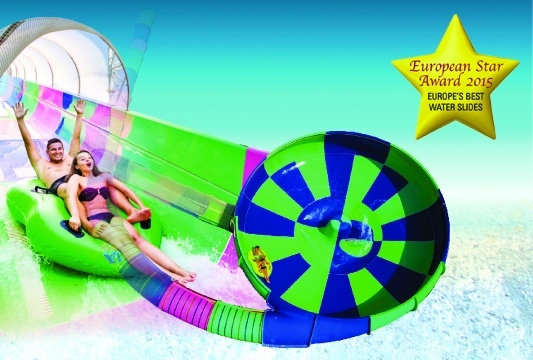 4000 pax capacity, 31 slides; Master Blaster Family raftslide, Boomerang slide, 2 Speedslides, Head-down, Proracer, 3 Gang slides, 1 Body and 2 Open Tube slides, 2 Enclosed Tube slides and different types of children slides, children’s section with Treasury Island, Wave Pool creating 7 types of wave, 400 meters long Lazy River,swim up bar with adults jacuzzi, adults pool, fast food units, free sunbeds and umbrellas. Treasure Island; Biggest Child Friendly Children Pool in Turkey, ‘’Pirate’s Ship’’ with 6 slides and interactive toys, ‘’Submarine Octopus’’ slide complex, Frogslide and Wreckship, (2) 4-12 ages group slides, (3) zero/entry toddler pools with toys. Unlimited free Access to Aquapark for the hotel guests.